The fun of embarrassing mum. Moms never ever stop doing that, even getting worse when they become grandmoms. “Grandson, did I ever tell you about the time your dad…” Arrrgh!!! The Ghost from Destiny would make a cool charm. I see where Nicole gets her cutes! I notice Kade says he “usually wear the Arwing one with my blue collar”, does he mean when he doesn’t wear the Pokeball one? Also, what’s their mom’s name? Some times, the dogs change their collar. 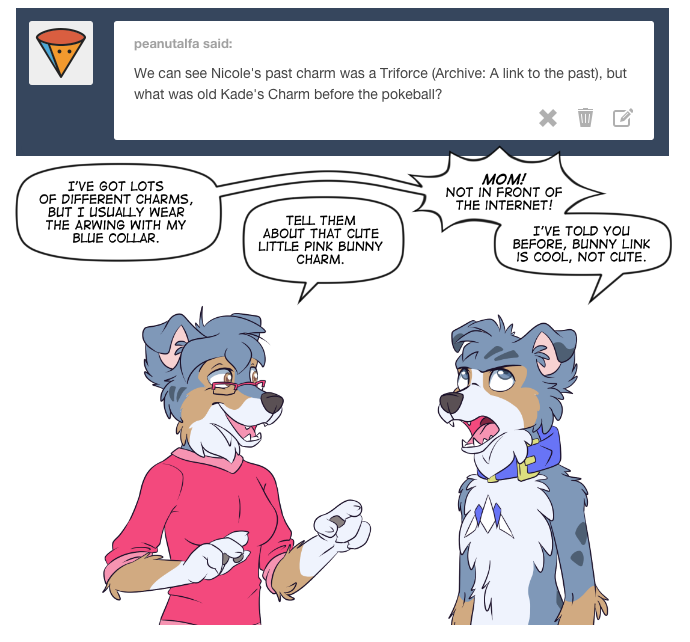 You see, as noted Kade likes the pokeball charm with the red collar. When he uses another collar, it goes with another charm. …Right. Of course. Of course it is. Sorry, Kade, even I have to admit that Bunny Link is adorable. awwww, i love that charm on kade! Yup, Kade’s green collar had a Kuribo Shoe on it from Mario 3 (you can just barely see the wined up key).